Dry brining vs wet brining is our topic of discussion today. We will be going over the pros and cons of each so you have the information you need to decide on your winner. Brining is a magnificent tool in any chef’s toolbox of meat preparation. Any serious griller, roaster, or even pan fryer should know how and why to brine meat. With that in mind, there are two traditional ways to brine meat: wet brining and dry brining. I find that one method is easier and less of a hassle than the other is, which sounds great. But does easier mean better? This led me to test both methods extensively. So, what is the difference between the two and which one is a better option for you? Whether to use a wet brine vs dry brine is one of the great debates of cooking meat. It is the milk and sugar vs black coffee, the automatic vs manual transmission, the tv vs movie of culinary meat. What makes the two so different? What even makes a brine? The differences begin with the preparation and continue from there. While both are effective preparations for your meat, they each have their own advantages. Here is a breakdown of which to use, when, and why. The majority of the time, people will sprinkle their meat with salt before cooking. But this only adds flavor to the surface of the meat. 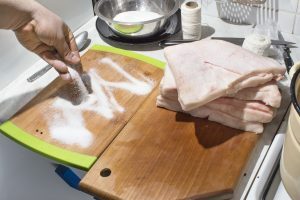 When brining, you are basically encouraging the meat to absorb the salt so it deep seasons throughout for an evenly seasoned bite every time. If you don’t over brine, you are not adding as much sodium to the meat as you may think. Just enough to flavor and tenderize it. The brining process not only helps evenly season your meat. It also helps create a phenomenal texture and helps lock in moisture to your meat so you don’t end up with a hockey puck instead of a pork chop. That right there is a fantastic reason to brine wouldn’t you say? Let’s take a look at the wet brining process first. Wet brining is a process involving gallons of water and cups of salt. It can end up a bit messy, which is one of the few downsides to using a wet brine vs dry brine. To start, dissolve about one cup of salt for every gallon of water necessary to totally submerge your meat (don’t place your meat in the water yet). In order to make sure the salt is completely dissolved, I like to heat the water up to a boil before adding the salt. This way I am sure there won’t be sediment in the bottom and a less salted water than I expect. You will be adding your meat to this mixture, but be sure to let the water cool down before that. You don’t want the water to start cooking your meat. I like to boil the water, add the salt, and then let it sit until it gets back to room temperature over a few hours. Next, add your meat. The meat should be completely submerged in the water, with nothing sticking out. Some meat will float, especially because of the high salt content, so you may have to place something over the meat to keep it underwater. Here is the most trying part of the process: waiting. This won’t matter between a dry brine vs wet brine because it is necessary for both. You need to leave the meat for quite a while, especially if it is a big piece of meat (like a full turkey or pork shoulder). A general rule of thumb is to let it soak for about one hour for every pound of meat. The timed soak is what allows the brining process to take effect, so don’t shortcut it. Word to the wise, always soak your meat in the refrigerator. Don’t allow extra bacteria to grow by leaving it at room temperature. It can be difficult to fit a large pot in the fridge, but it is very necessary. For smaller cuts of meat, like a few chicken breasts, you can place the wet brine in a Ziploc bag, but I still recommend placing that in some sort of bowl to avoid a mess if it leaks a bit. Adds moisture and tenderness to meat for cooking. The meat absorbs more water moisture than when dry brining. You get a better seasoning as it absorbs into every nook and cranny. It tenderizes and relaxes the meat. You can mix additional spices to the salt and water mixture for added flavor. The meats natural juices are pulled out and replaced by the water and salt for a less flavorful experience. 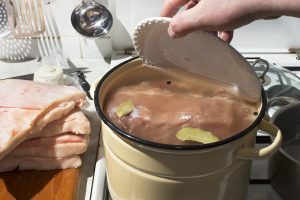 Although wet brining creates a more moist meat, the finished product may seem a little mushy and the flavor may be somewhat diluted. Wet brining produces so much moisture on the surface that it is harder (but not impossible) to brown and create a seared in crust. The color will be more of a grayish brown than a whiskey, mahogany brown. You can read more on the ins and outs of wet brining by reading What Is Wet Brining? A Grillers Guide To The Benefits Of Wet Brining. The dry brine process is a bit less messy than the wet brine. I would say it is a simpler process overall. You just have much more control of the mess factor. Begin by sprinkling salt over your cut of meat. I use about a ½ teaspoon for every pound of meat. Be sure to cover all sides of the meat. The more equally covered the meat is, the more salt will be absorbed (which is the whole point). I use thick kosher salt pieces. It allows you to cover the meat thoroughly while still giving the meat small openings to breathe through. Next, chill out. Let the meat sit on a plate or wire rack above foil in your fridge (same thing, don’t let more bacteria grow by leaving it out… that’s gross). The amount of time you should let it sit depends on the type of meat and weight of the cut. It can be anywhere between a few hours and several days. Generally, large pieces of meat (think over 7 pounds) should sit for at least 12 hours. Meat other than poultry should sit longer, but poultry shouldn’t sit as long to avoid harmful bacteria growth. Small pieces like chicken breasts, pork chops, and steaks can sit for 3 to 12 hours and be totally ready. Boom. Set. Time. That is your preparation for dry brining. A big perk of dry brining vs wet brining is the simplicity of the dry brining process, but a drawback is the confusion of the wait times depending on the size and type of meat. Much less mess and easier to do. Dry brining is as simple as sprinkling salt on the meat and placing it in the refrigerator for a few hours or more. Takes up less space and requires much less salt. You can add additional spices or rubs to the salt for added flavor. You are brining the meat with more of its own juices. It is easier to get a nice browned, crusty seared in bark using a dry brine. It takes away the guesswork on how much salt was absorbed. For poultry, it creates a much more crisp skin. Wet brining softens the skin. Harder to make sure the salt gets into every nook and cranny. Does not penetrate as uniformly as a wet brine does. It’s easier to over salt your meat if you over do it. The process can’t be rushed. If you start cooking before the briny moisture fully reabsorbs back into the meat, it will come out dry. 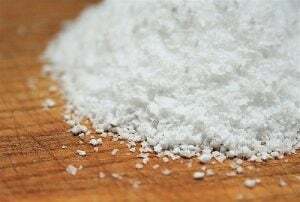 You can also read more on the ins and outs of dry brining by reading How Does Dry Brining Work – A Grillers Guide To Dry Brining. Both dry brining and wet brining are used for the same things. First, to improve the flavor of the meat. Both processes help draw salt (and any other seasoning you use alongside the salt that can be dissolved) throughout the meat. Also, brining in either fashion helps soften the meat’s texture. The salt helps loosen the muscle tissue, making the texture softer. Another perk that brining has is locking moisture in the meat. By soaking salt through the meat, it holds onto its moisture more through the cooking process, giving you a moist meal when ready. Wet brining can do a better job of evenly soaking through the meat, especially in the nooks and crannies of whole turkeys and chickens. Since the meat is certainly surrounded by water, the wet brining finds every little spot. Also, the wet brining can be more effective at bringing moisture into the meat of large cuts. Most meat will come out heavier than before wet brining. Smaller pieces of meat will lose some of that moisture, leaving it at about the same weight as after dry brining. Large pieces of meat will tend to hold the moisture more and end up moister through a wet brine vs dry brine. Dry brine’s give you a less messy way to brine meat. I avoid dealing with gallons of water whenever possible. I also have a habit of spilling such water everywhere, which is a horrible experience and I advise completely against it. Dry brining can also give a nice texture to the surface of the meat. Since the salt crystals themselves are sitting on the meat’s surface, it can garner a delicious crust that is both crispy but not super thick. It is a wonderful way to protect against an overly thick crust while smoking or slow cooking meats. So, there you have it. The brining processes both have great perks and some unfortunate drawbacks. One thing is certain in this debate. Brine how your brine, but brine nonetheless. There are arguments far and wide about why to use one over the other, the reasons I gave above are the most noticeable differences I see. They are hard to deny and make the processes subtly different. Either way though, wet and dry alike, brining is a great idea and worth the attempt. Both take patience, and extra prep work, but the time you put in earlier on will certainly be worth it when you taste the end product of your patience. 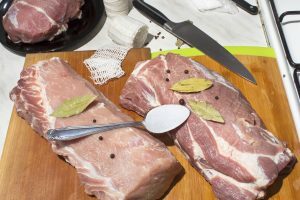 You can also check out this article on How To Brine Meat – An Intro And Guide To Brining for a more in depth introduction to wet and dry brining meat. As always, if you or someone you know find this information on Dry Brining vs Wet Brining; please consider sharing it with your Grilling friends and on social media! If you would like to leave a comment or have useful tips of your own to share on Dry Brining vs Wet Brining, please do so below. We always welcome your input.